Need help removing your good old living room furnishings? Better Cleaning Company is a respected local professional rubbish removal Waltham Forest E company and can really help you. Our waste collectors can deliver domestic and commercial waste disposal service at a great price 365 days a year. We offer reliable and affordable garden waste collection Waltham Forest E, loading & disposal. Our rubbish collectors are specialised in quick and proper green waste removal, brown waste removal and waste recycling or dumping. They will certainly pick up any hedge and grass cuttings, twigs, branches, leaves for you and dispose of it in authorized and proper fashion. Our hassle-free rubbish collection service is performed by specially educated, qualified experts. They are all vetted and totally insured. Don`t wait to ask for an advice or discuss the waste disposal in Waltham Forest with the operators until they find the ideal solution for you. It`s their job. Note that the service is first quoted, because nor the cost nor the duration is fixed. The junk removal specialists come to analyze the property – loft, garage, apartment, house, basement, commercial IT or Tyre building, stockroom, etc – to see its size and to check the volume and the type of the rubbish. Then, the cost is set and the date for the junk removal is decided. When you agree, the removal staff are ready to act ASAP! Managing building waste is a true hassle if you are not set up with the right tools, transportation and if you don’t have a helping hand. No worries - we are here to provide you professional building waste removal Waltham Forest E according to the regulations and laws. Our service is in particular useful for renovation debris removal as well as bulky waste clearance. Our crew will do all the weighty loading & lifting of the builders waste. We will help you save time, effort and financial resources for leasing a van etc. If you want help with the clearance, loading and disposal of rubbish and other undesirable items, get our effective rubbish removal service now! 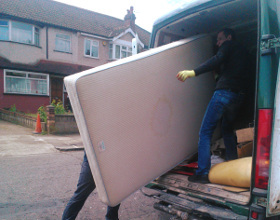 If you need to book our excellent quality rubbish removal services Waltham Forest E, you need to contact our 24-7 phone line 020 3746 3201 or submit an online booking form for a free viewing or directly buying our service. Better Cleaning Company assures a rapid arrival of our seasoned two men teams at your home. They will inspect the volume of the waste, and will offer you a price quote right then. Loading & collection will commence immediately after that. As a licensed rubbish waste carrier we always recycle on your behalf.